While traveling abroad, it’s hard not to notice the works of art created by talented modern sculptors out of simple stone and metal. To save you from flying across the world, we put together a list of the most creative sculptural masterpieces that brighten up our globe. 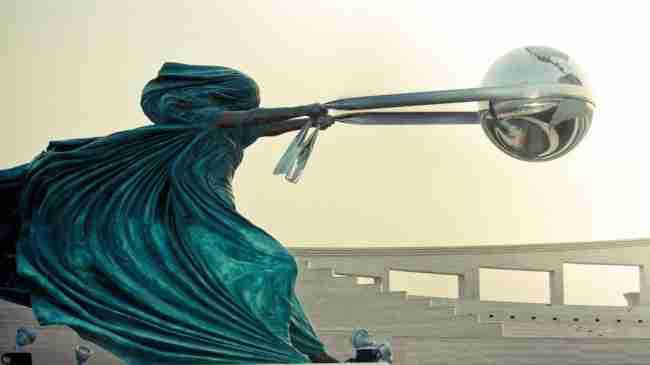 This is a series of sculptures by Italian artist Lorenzo Quinn depicting Mother Nature as a woman hurling the planet around in circles. Slightly different versions of this piece have been installed all over the world: in England, US, Monaco, and Singapore. Mihai Eminescu is one of the most important poets of the Romanian language. 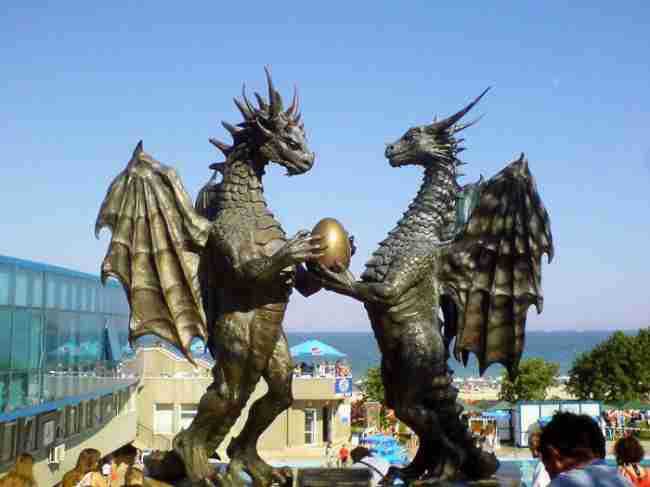 He is cherished as an international literary success in both Romania and Moldova. 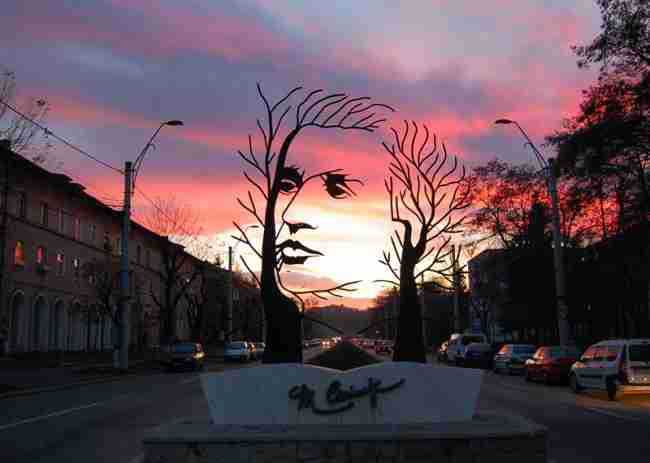 This sculpture, dedicated to him, is especially beautiful at sunset or sunrise. 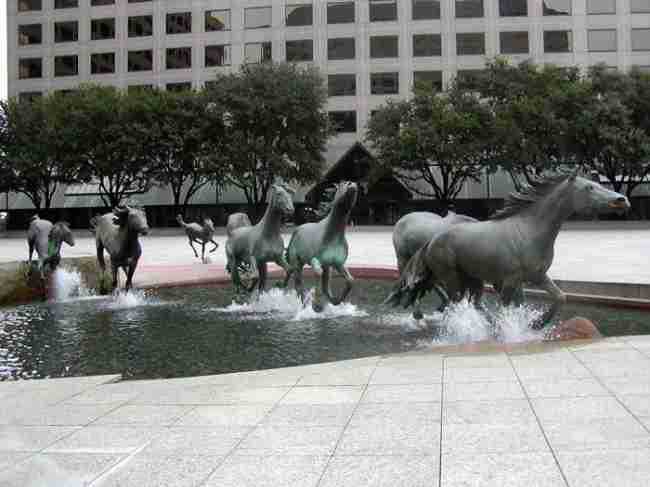 At one and a half times their real size, this sculpture portrays a group of wild mustangs galloping across a granite stream. The idea is to show the drive, initiative and unfettered lifestyle that were fundamental to the state of Texas in its pioneer days. 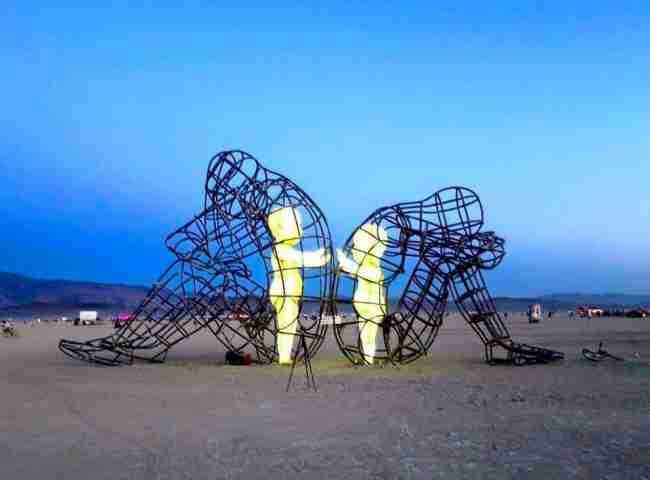 This extraordinary sculpture is considered to be one of the highlights of modern art. 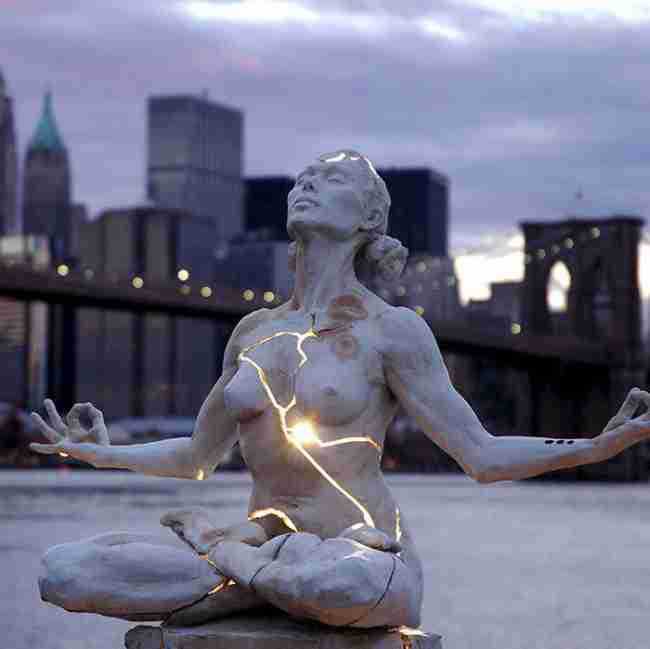 The author, Page Bradley, says that "Expansion" is a result of her speculating about people’s questioning attitude towards sculptures depicting humans. It dares us to go beyond what we are. The sculpture is currently in a private collection in New York City, copies can be seen in London, UK and Palm Desert, California. John Lopez’s art is formed through creativity, talent, and a sprinkling of environmental awareness. 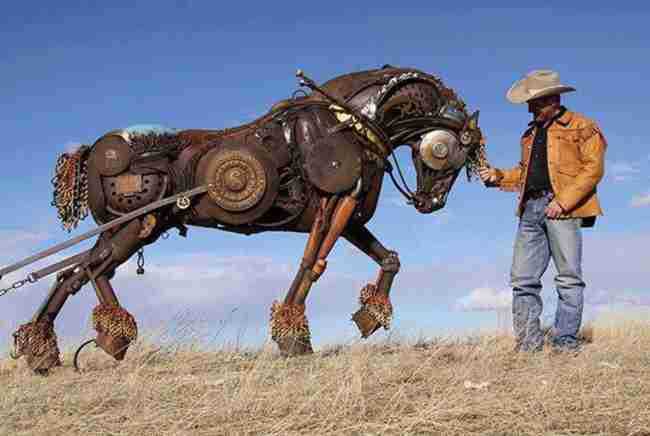 His amazing ability to upcycle old metal into monolithic pieces is helping him to make a name for himself. Poland is a land that, without a doubt, has lived through a lot. 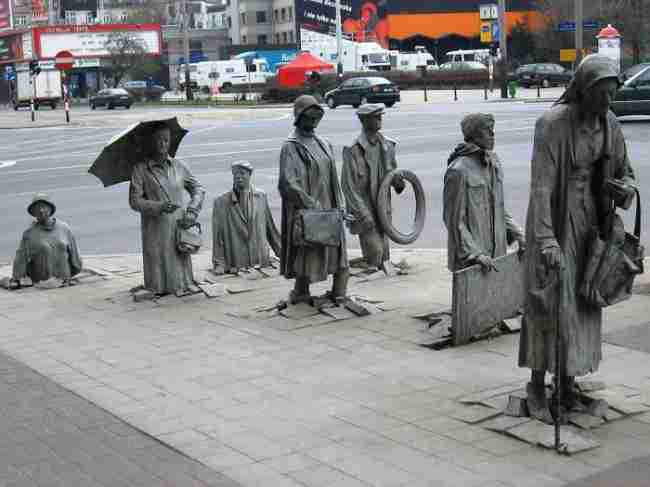 These bronze statues represent the hordes of people who disappeared ("went underground") in the middle of the night after the imposition of martial law in Poland on December 13, 1981. 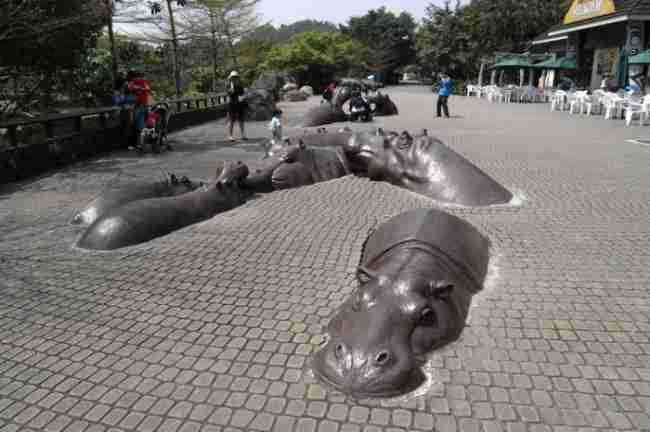 The sculpture at the Taipei Zoo is a creative reminder of how important it is to protect our wildlife. 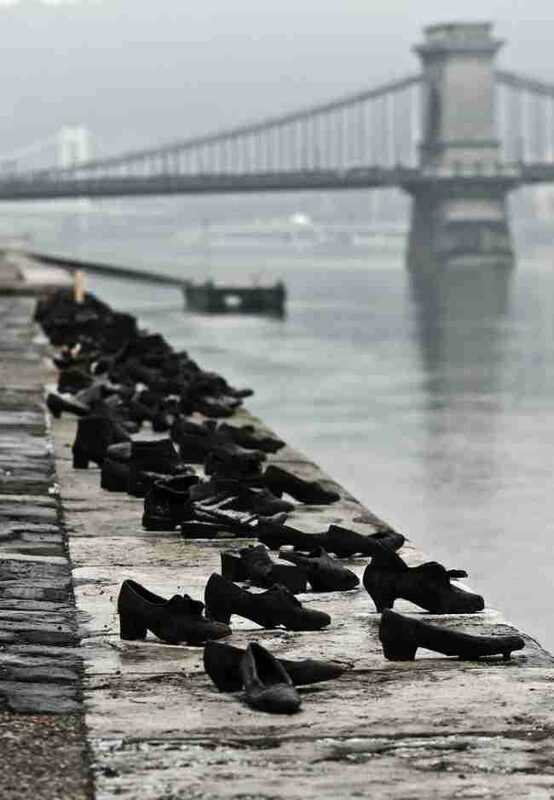 Sixty pairs of rusted vintage shoes cast out of iron became a living memorial to the Hungarian Jews. Different sizes and styles reflect how nobody was spared from the brutality of the Arrow Cross militia in the winter of 1944-1945. The sculpture was installed in 2005. 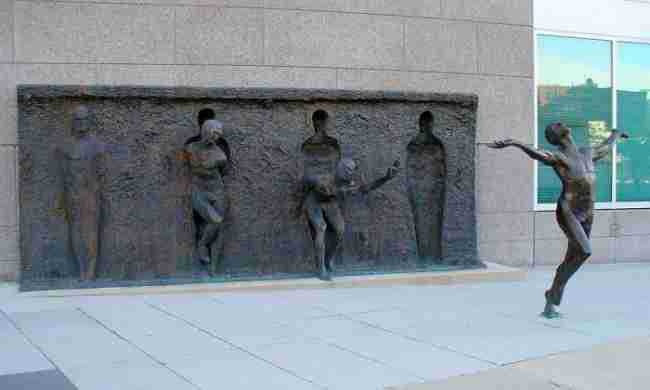 Bronze artwork of Zenos Frudakis shows a person breaking free from a grey mass of anonymous bodies. According to the artist, it’s about "the struggle for achievement of freedom through the creative process". 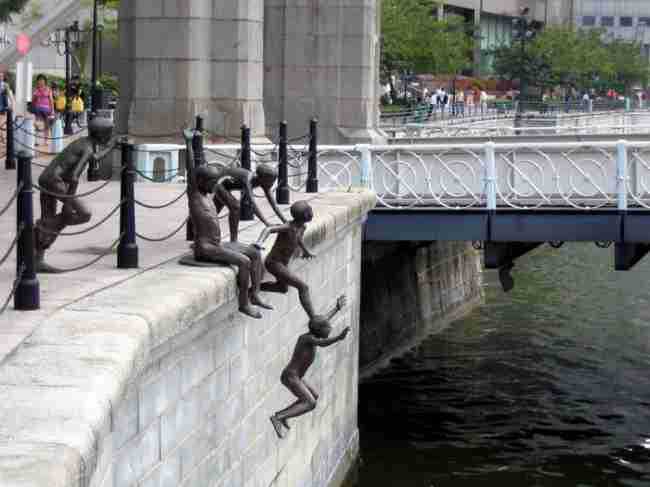 “The First Generation“ is a part of a series of statues entitled ”People of the River", depicting various scenes from Singapore’s history. 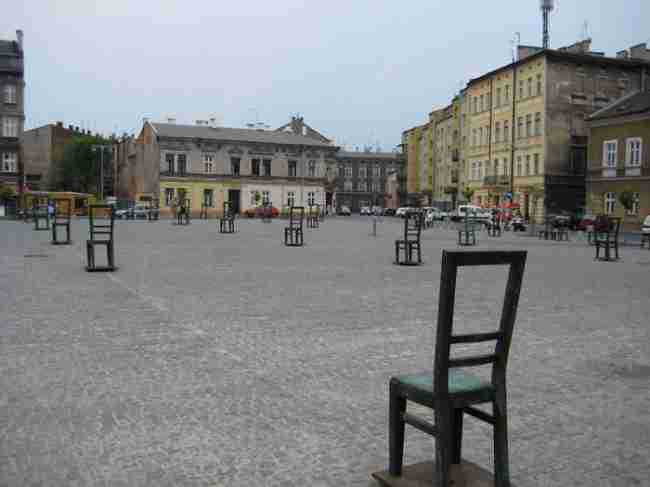 The sculptural composition features 33 iron chairs on the site of the former ghetto and 37 chairs standing on the edge of the square and at tram stops. The theme of empty chairs suggests that anyone can be a victim. It also speaks to the history of ghetto, when all the furniture from Jewish homes was being brought outside so that people wouldn’t be able to hide their kids. 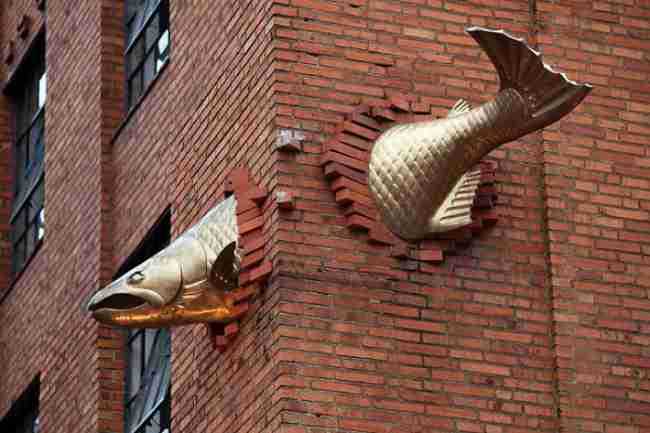 This metal salmon of considerable size seemingly swims through a building on Salmon St. in Portland, Oregon. 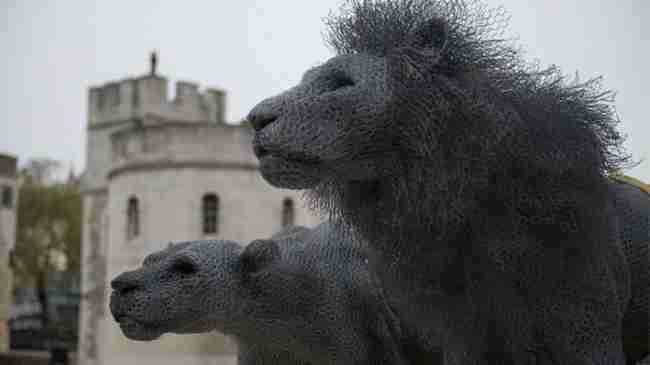 Created out of fine black wire, these lions, created by professional sculptor Kendra Haste, stand guard at the Tower of London. This bronze, stainless steel, and marble sculpture measuring over 30 ft high and over 33 ft wide was created in 1999 as a part of Louise Bourgeois’ inaugural commission for Tate Modern’s Turbine Hall. 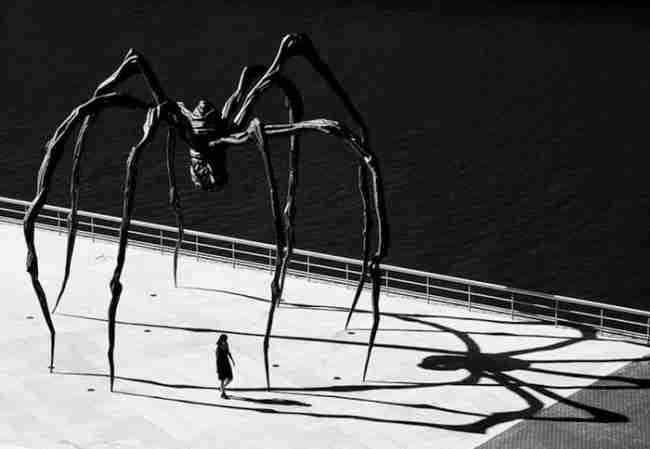 “The Spider is an ode to my mother,“ says the sculptor, ”She was my best friend. Like a spider, my mother was a weaver. " This truly gargantuan project took nearly 7 years to develop. 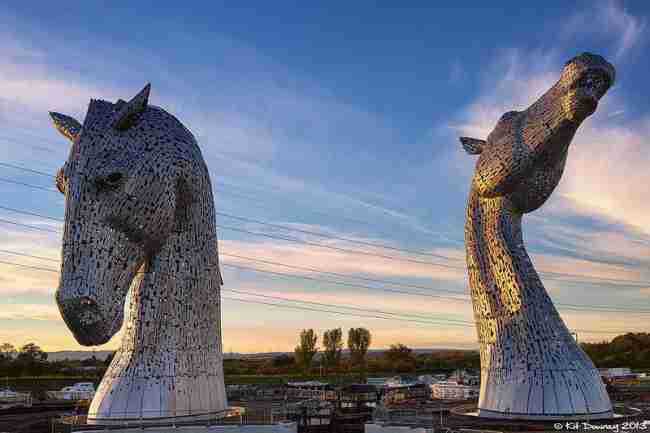 100 ft high horse-head sculptures were inspired by the tradition of working horses in Scotland which once pulled the wagons, ploughs, barges and coalships where The Kelpies now stand. 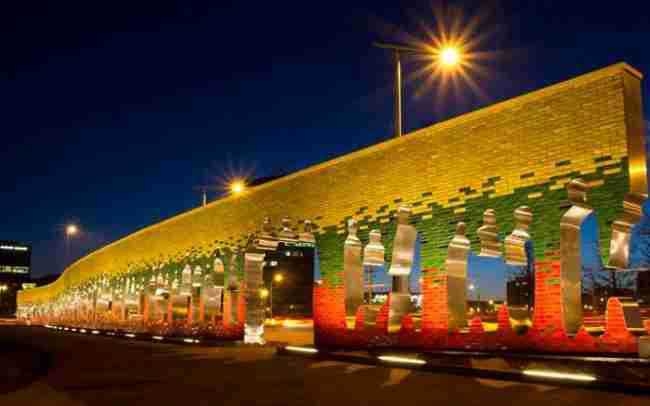 "The Road of Freedom" commemorates the twenty years of restoration of the Statehood of Lithuania. Its goal is to remind people of the ideas of unity and freedom. 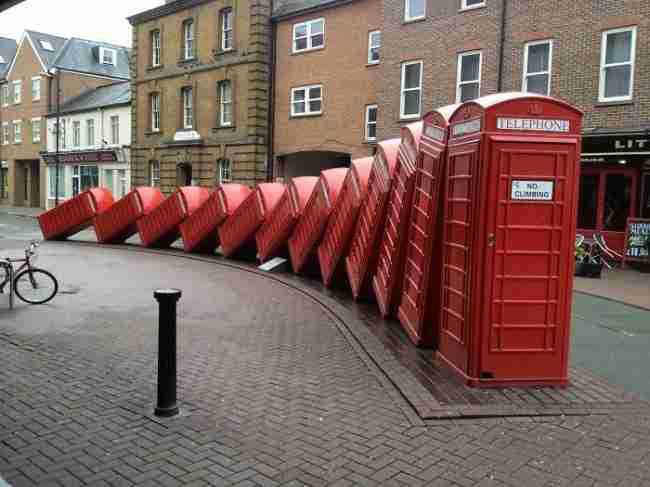 Also known as "Tumbling Telephones", this sculpture involves twelve classic K6 red telephone boxes. They are gradually falling, much like huge domino pieces, representing the end of an era when phone boxes were used instead of mobile phones. 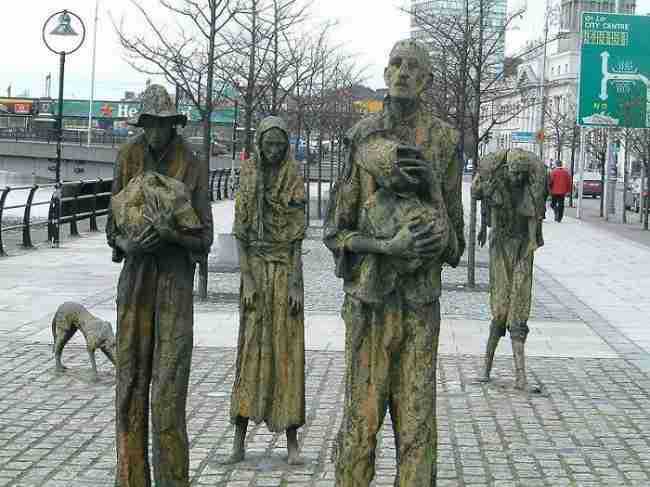 These statues commemorate The Great Famine of the mid 19th century, which had a profound effect on the country’s history. During the famine, the island’s population fell by 20%-25% due to mass deaths and emigration. The author of the monument, sculptor Darin Lazarov, says he created this fairy-tale composition to please local kids — there’s a pool nearby where they train.